This makes it the world’s first fully waterproof interchangeable lens camera. There are even two waterproof lenses available – the 11-27.5mm kit lens that comes with the camera, and a 10mm prime with a maximum aperture of f/2.8 for a shallow depth-of-field. But don’t worry if you think two lenses sounds restrictive, as all of the other nine Nikon 1 lenses fit this body, though they’re not waterproof so can only be used in dry conditions. The system of seals and gaskets that Nikon has used to keep the elements out is quite an accomplishment, with every button, flap and mount absolutely watertight. The lens mount is sealed with a rubber O-ring, and the lenses are designed to have a very tight fit with the body, which is very evident when attaching and removing them. On the battery compartment and external connections bay there’s even a safety lock to stop you flicking them open under the water by mistake. The camera also has a built-in pop-up flash that can be used underwater at full depth. This really is an impressive piece of kit. As well as being waterproof, the Nikon 1 AW1 and its lenses are also shockproof up to 2m. This means the camera can be dropped from over 6ft and it will still operate. It will dent and scratch like any other camera would, but its basic functions will work. The camera will also operate at temperatures as cold as -10°C and the seals will keep out sand and dust. All of this makes the adventure-proof Nikon 1 AW1 perfect for extreme sports photographers, scuba divers, and people going travelling who need a camera that can take a high degree of punishment. It may even appeal to photographers with young families so they don’t have to worry about keeping their kit safe. Waterproofing aside, the general functionality of the 1 AW1 is almost identical to the Nikon J3, which was released early in 2013. Not only do the two cameras look fairly similar, they share the same 14.2MP sensor, the same ISO range of 160-6400, and pretty much everything else, other than the fact the 1 AW1 comes with GPS but without a Vibration Reduction (VR) kit lens. In other words, if you buy a Nikon 1 AW1, you’re getting an armoured J3, which isn’t bad since the price difference between the two is only £370, and that figure will inevitably fall over the coming months as the 1 AW1’s price begins to drop. If you were to buy Nikon’s waterproof housing for a J3, it would cost you £600 alone. As on the J3, the 1 AW1 has a 3in 920k-dot TFT LCD. The screen doesn’t flip-out or tilt and isn’t touch-controlled, but we wouldn’t expect that kind of functionality on a waterproof model. The camera also has no viewfinder, so users are reliant on the screen for composing and reviewing images. On some cameras this can be a problem because on brighter days the screen can be difficult to see, but on this model the screen is relatively clear in all conditions. It also has brightness control built in. The Nikon 1 AW1 comes with an EXPEED 3A processor, which was developed for the Nikon 1 series and appears in all current 1 series models. With a very fast processing speed of 850MP per second it enables smooth, responsive camera operation, and facilitates features such as shooting stills during video recording without interrupting the footage. It also allows a very fast shooting speed, which on this camera is 60fps in RAW or JPEG in manual focus, or 15fps with continuous focusing. This is useful for capturing fast-moving subjects or fleeting moments in time. The camera’s buffer can only hold about 20 or so images though, so the shooting speed of 60fps only lasts for 1/3sec before it slows right down. For me, this renders the fastest shooting speeds that this camera offers near useless. As well as fast shooting speeds, the Nikon 1 AW1 also has very responsive autofocus, boasting 135 focus areas, the central 73 of which are phase detection. We found the hybrid AF system fast and accurate, even in difficult conditions such as shooting fast-moving subjects into the sun. It also offers subject tracking, which is great for sports and wildlife. The 1 AW1’s shooting modes include an underwater setting, and it has picture control pre-sets for different subjects. It shoots Full HD video at 30fps, or HD video up to 60fps, great for slow motion footage. The camera has Wi-Fi connectivity and GPS built-in, and an altimeter, depth gauge and electronic compass. The battery life of 220 shots is disappointing, as it means adventurers who want to take the 1 AW1 into the great outdoors won’t get far before they’re out of juice. A spare battery costs £35. Lens quality is fairly impressive, with very little chromatic aberration even at wider apertures. Corners are soft below f/5.6, but it’s quite minimal for a CSC. Distortion is more noticeable, with considerable barrel distortion at 11mm and pincushion distortion at 27.5mm. This camera looks great and feels good in the hand, with smooth, rounded edges, large buttons, and a small thumb grip on the back and a finger grip on the front. At just under 400g it’s reassuringly heavy, but if you drop it in the water, a handstrap, which is available in bundles or separately, will keep it afloat. The 1 AW1 has an innovative Action Button for quickly changing settings. Simply press it, tilt the camera to the right setting, and then let go. There is no finger dial, though the zoom buttons on the back can alter settings. There’s no direct access ISO button, so you have to use the menu to change what is one of the most important camera settings. We’re sorry to say that for us, this is a big deal. The Nikon 1 AW1 was tested extensively in the studio to assess the level of digital noise at different ISO settings. We found that it can produce relatively noise-free images up to around ISO 1600, so it copes well when shooting in low light conditions. Noise is more noticeable at ISO 3200, though images are still perfectly useable. At the maximum ISO of 6400 image quality is significantly reduced, and noise is more severe, so this setting should only really be used when there is no alternative. In real world shooting noise is less visible at higher ISOs. Overall, the 1 AW1’s noise performance is relatively good, though not as impressive as some similarly priced CSC models. 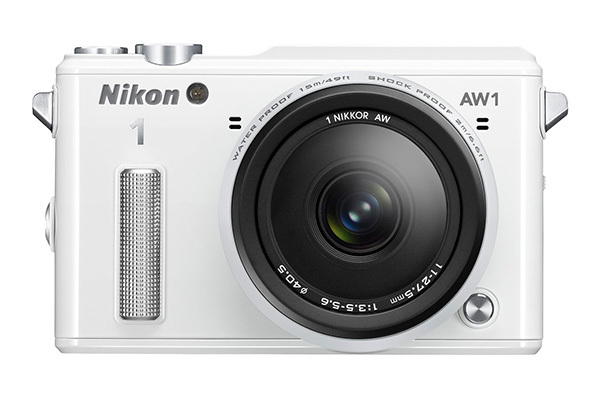 The 14.2MP Nikon 1 AW1 is a revolutionary camera, being the first interchangeable lens model that can be used underwater without waterproof housing. Its well-built body can be dropped from up to 2m or used in dusty or freezing conditions. Image quality and low light performance are both good. All that’s missing is an acceptable battery life and a direct access ISO button, but otherwise this is a superb camera which currently has no competition. It should be remembered though, that the 1 AW1 is a niche model, and its price reflects its speciality features. It offers the same image quality and similar functionality to Nikon’s J3, but if you’re not going to make use of the adventure-proofing and GPS, you may as well save the £370 and get the VR lens, or consider the Fuji X-M1, which is in the same price bracket but has better all-round image quality.